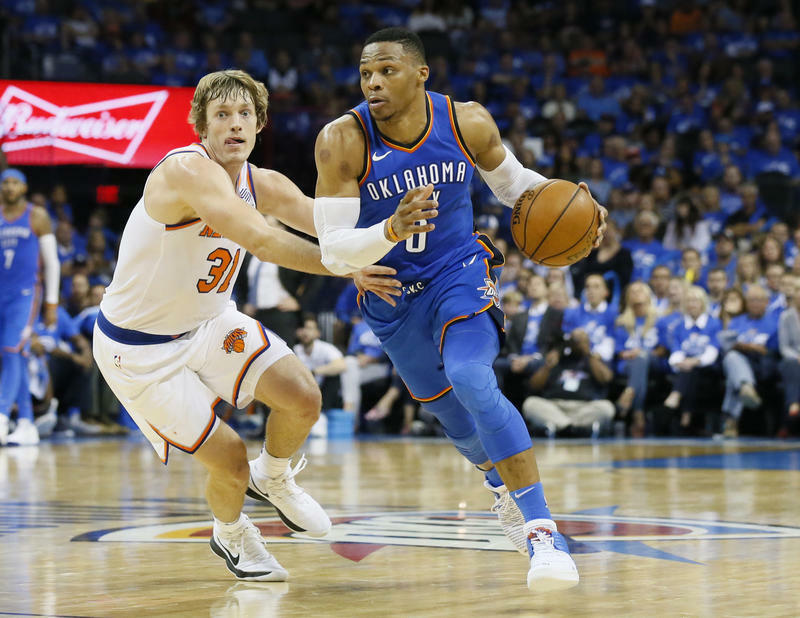 Oklahoma City Thunder guard Russell Westbrook (0) drives around New York Knicks guard Ron Baker (31) in the fourth quarter of an NBA basketball game in Oklahoma City, Thursday, Oct. 19, 2017. Oklahoma City won 105-84. As the Oklahoma City Thunder open a their tenth season, restaurants and vendors at Chesapeake Energy Arena are unveiling new food options. Molly Fleming writes in the Journal Record that chef Andrew Murin completely revamped the menu at Budweiser Brewhouse. He now offer bruschetta, nachos with rotisserie chicken, salmon and desserts with Bedre chocolate. “His menu has a local focus. He worked with Fresh Point to find farms, looked to those farms' produce lists and then made his menu from that,” Fleming told KGOU. A convenience store will open as well, which will allow visitors to buy soda or candy and not have to wait in a long line. Fleming says convenience stores are a trend in NFL stadiums that is now catching on in NBA venues. Additionally, an Alabama-based company called KultureCity is offering a new service that could help fans with autism enjoy the game. “When people come to Thunder games this season and they have somebody with some sensitivity issues, they can go to Guest Services and check out a bag that will come with amenities like noise-canceling headphones. They can also check out a weighted blanket. The bags also have fidget items,” Fleming said. There will also be quiet room for families with autistic children, which can also be used by nursing mothers. Jacob McCleland: It's the Business Intelligence Report, a weekly conversation about business news in Oklahoma. I'm Jacob McCleland and I'm talking today with Molly Fleming. She's a reporter with The Journal Record newspaper. Hey Molly, what's up? Molly Fleming: Hey, doing well. McCleland: So the Oklahoma City Thunder, they kicked off their 10th season last night and with the new season comes some new food options in the Chesapeake Energy Arena. First though I mean how does this work? Are the different food vendors at the arena or are they all owned by the Thunder or are they independently owned businesses? How does this all work? Fleming: Yes. SMG manages the arena. They employ everyone that works there and so the Oklahoma City Thunder are one entity that uses the Chesapeake Energy Arena which is a city-owned facility. So there are two companies that handle the food over there. Levy Restaurants works in the Continental Court House Club and the suites level. And Savor which is a part of SMG does the food on the first and third floors, or of course Loves Loud City. So the smaller concession stands that you see throughout the venue are actually operated by one of those companies. McCleland: What are some of the different food options that are reflecting some different changing styles and tastes today? Fleming: On Wednesday the media was invited to go to a day we we go around and try all the different food the new things. They remind us every year it's a marathon not a sprint. And so for two hours you try a bunch of different food. So at Budweiser Brewhouse, they actually have a whole new menu this season. Chef Andrew Murin had to change the menu because of a barbecue stand that opened on the same floor. And so he noticed in his restaurant sales they were his barbecue wasn't selling it as much because he a barbecue place next door. So he changed things up. He is now serving on items like bruschetta, nachos with rotisserie chicken, salmon and even desserts with Bedre chocolate. His menu has a local focus. He worked with Fresh Point to find farms, looked to those farms' produce lists and then made his menu from that. On the Levy side which is the concessions I guess said on the suite's level, Chef Ryan Craig made a Carmello Sunday of course playing off the name of the team's new addition Carmelo Anthony. He also has the chicken fried steak cheeseburger and he said his focus was to bring some Oklahoma favorites to the menu. He wanted to really play up Oklahoma since this is the 10th season. McCleland: One of the new additions is a convenience store. I mean what's the goal of having a convenience store in a basketball arena? Fleming: To put it simply convenience. If you want a bottle of soda or candy and not know wait a long line because you know a lot of the you go to line some people are taking orders for their whole row or their whole family. So you can just go to the store and grab it. There will likely be medicine available as well. Maybe some Tums for that chili dog that regret eating. So Savor is overseeing this on the third floor. It's in Section 317. And when I talk to Savor about it they said it's a trend that's moving into NFL stadiums and slowly into NBA arenas. McCleland: Another new service will will help people with autism enjoy games. What's kind of the the concept behind this? Fleming: So KultureCity is a company out of Alabama and they have partnered they're partnering with the Thunder actually they're partnering with Chesapeake Arena. KultureCity is founded by Dr. Julian Maha and his son is nine years old and he has autism and so he but his son is a big basketball fan he said. And so he worked on some techniques or some amenities that would help his son enjoy the game. And so when people come to Thunder games this season and they have somebody with some sensitivity issues they can go to Guest Services and check out a bag that will come with amenities like noise-canceling headphones. They can also check out a weighted blanket. The bags also have like fidget items and a board or something that shows like how you're feeling. You can point to your kind of gauge your emotions on that. And if that doesn't help you can always go to this new quiet room and then people in families can stay in there for a few minutes. The quiet room is also available for nursing mothers. So the Thunder are those second NBA team behind these amenities. The Cleveland Cavaliers are the first. And when I talked to Dr. Maja how about it, jokingly said that you know if we could have two KultureCity teams play each other in the NBA finals. McCleland: Molly Fleming is a reporter with The Journal Record newspaper. Molly thank you so much it's great talking about the new Thunder season with you. McCleland: KGOU and the Journal Record collaborate each week on the Business Intelligence Report. You can find this conversation at KGOU.org. You can also follow us on social media or on Facebook and Twitter, @journalrecord and @kgounews.